ECO STYLE Sports Voyage Rolling Backpack Laptop Carrying Case - 17.1-inchSports Voyage Rolling Backpack is stylish and feature rich and will accommodate laptops up to 17.3”. Dedicated tablet/iPad compartment Front workstation includes: key fob, business card holder, padded cell phone pocket, pen/pencil holders, zippered mesh pocket to protect your valuables along with a slip pocket for your additional belongings. Laptop compartment with premium protection includes an adjustable seat belt strap Dedicated space will accommodate a set of clothing or a secondary device such as a laptop, portable printer, gaming device, books and files. 2 Exterior zippered side pockets to accommodate your water bottle, sunglasses and accessories. Innovative design transforms rolling case into a sleek backpack. Ergonomic shoulder straps includes cell phone holder and extreme padded handle along with ergonomic shoulder straps makes this backpack ideal to carry/wheel around. 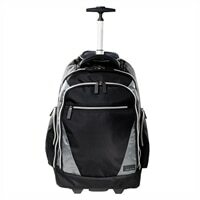 Sports Voyage Rolling Backpack is stylish and feature rich and will accommodate laptops up to 17.3”. Dedicated tablet/iPad compartment Front workstation includes: key fob, business card holder, padded cell phone pocket, pen/pencil holders, zippered mesh pocket to protect your valuables along with a slip pocket for your additional belongings. Laptop compartment with premium protection includes an adjustable seat belt strap Dedicated space will accommodate a set of clothing or a secondary device such as a laptop, portable printer, gaming device, books and files.